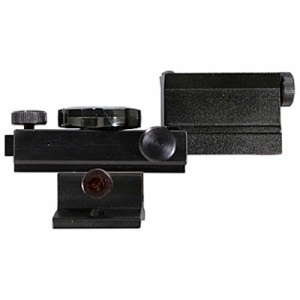 AAC-0002 X-Y Adjustable Mount System for quick installation of TeleVue 60 to Schmidt- Cassegrain scopes 8" or larger for use as a "superfinder", or to attach to a TeleVue Ring Mount. 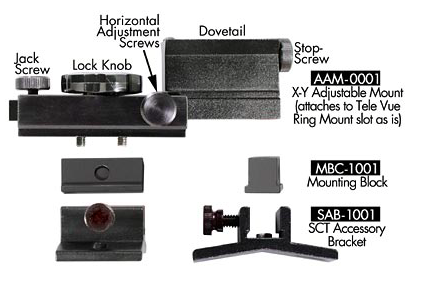 The large knob acts as a pivot for the 2 horizontal adjustment screws, while simultaneously acting as the lock knob for the vertical "jack screw" adjustment. Removing the "stop screws" on the end of the TV-60 dovetail permits easy removal and installation onto the similar AAM-0001 dovetail. Remember to reinstall the "stop screw" for safety after the TeleVue 60 is mounted. Note: This mount, without the mounting block and SCT accessory bracket can attach directly to the slots in the TeleVue telescope ring mounts.